Fairy Tale Fandom: Fantasy Literature Rewind: Beatrix Potter the Complete Tales. 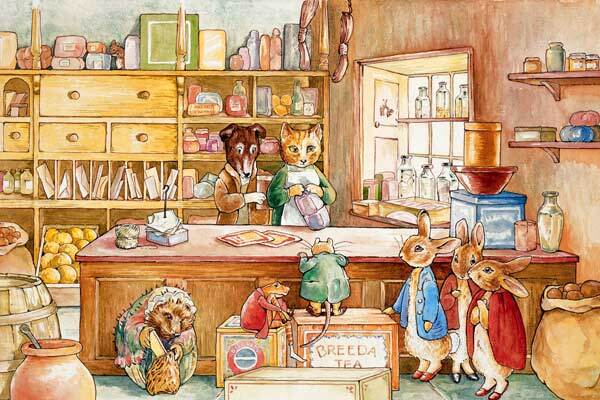 Fantasy Literature Rewind: Beatrix Potter the Complete Tales. It’s funny how we make certain associations and they become tradition. Certain days and certain stories just seem to come together even though they may have originally had little do with each other. 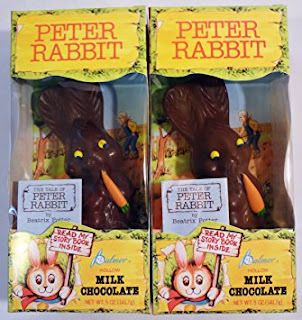 In my family, these chocolate Peter Rabbits were our chocolate Easter bunnies. Each of them came with a little paper booklet that reprinted The Tale of Peter Rabbit, albeit without the lovely watercolor illustrations usually associated with the story. 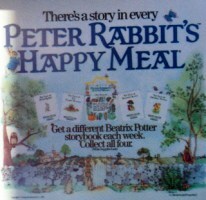 Strangest Happy Meal of my childhood. Pretty much the only time I ever remember them giving out books, though a little research shows they’d done it a couple of other times too. But anyway, to prepare this special post for Easter I decided to read the entire collected tales of Beatrix Potter. That’s right, all twenty-three of them. Every single animal story she had in her repertoire. First, a little bit about the author. As was the case with many upper class Victorian girls who were educated at home, Beatrix Potter had something of a lonely childhood. However, she had two interests that brought her joy: nature and art. Her parents encouraged her by bringing her to art galleries and providing her with tutors. She and her brother would also keep any number of pets in their schoolroom. These pets would often become the subjects of her artistic endeavors. As she got older, she would continue to keep pets. When she started writing picture stories for the children of friends and relatives, these pets would often find themselves turned into the characters in her stories. These stories then led to her career as an author. But writing children’s books was only a small part of what she did. She was also a farmer, naturalist and conservationist. Her watercolor paintings of mushrooms made her respected in the field of mycology. She owned the farm of Hill Top in England’s Lake District and was a prize-winning breeder of Herdwick sheep. She also worked with the newly formed National Trust to conserve areas of natural beauty within the Lake District. Despite living in a time period in which women had few opportunities, Beatrix Potter managed to accomplish an awful lot. But it’s probably her stories that gained her the most fame. And like I said, I just read all of them. What did I think of them? Well, they’re not bad. I may have experienced some unexpected side effects from trying to read the whole thing in under a week and a half (I swear I started to hallucinate in watercolors). But overall, they’re a pleasant collection of children’s books. For the most part, Potter’s books are largely standalone picture books centered on one character or group of characters. Most of them with the naming structure of “The Tale of [insert name here]”. One of the more notable things that slips by people is the sense of fatalism they have. Peter Rabbit’s father is referenced as having been baked into a pie by Mrs. McGregor. Squirrel Nutkin’s tale gets bitten off by the owl Old Brown. Pigling Bland get taken in by a farmer who plans to make hams and bacon out of him. 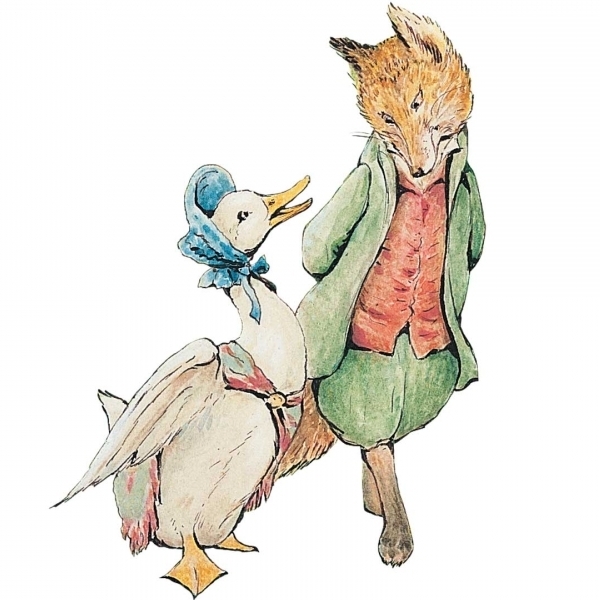 Jemima Puddleduck nearly gets eaten by a fox only for her eggs to get eaten by a couple of hungry dogs. It’s not really surprising for anyone who knows children’s literature from the late 19th and early 20th century. And Potter was a savvy enough naturalist to know how brutal the lives of animals would have been. But I think a lot of people overlook it when they see the pretty drawings of cute animals in clothes. And speaking of putting the animals in clothes, there’s a weird sort of internal logic to these stories. The animals are simultaneously human and not human throughout. At first it seems like human beings are unaware at how like people animals are. In The Tale of Peter Rabbit, Mr. McGregor just finds Peter’s jacket and shoes and hangs them on a scarecrow. 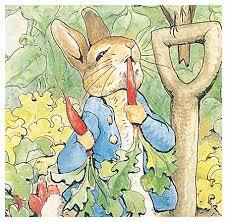 In The Tale of Benjamin Bunny, McGregor’s surprised to find that Benjamin left tiny clog-prints all over his garden. By contrast, The Tale of Pigling Bland features pigs who humans openly talk to, but also openly eat. There’s even a plot point about how pigs travelling alone have to have special licenses that they can show to the police if they ask. Who knew England was practicing such strict pig control? Possibly the most unusual example though, is The Tale of Mrs. Tiggy-Winkle. The book centers on a young girl named Lucie who has misplaced her pinafore and pocket handkerchiefs. She goes searching for them only to find the home of Mrs. Tiggy-Winkle. 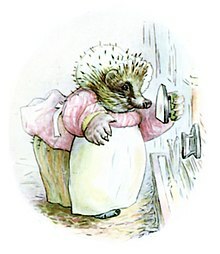 The thing about Mrs. Tiggy-Winkle is that she’s a hedgehog as well as a washerwoman. Lucie doesn’t seem to register this at first, though. It’s almost as if she has walked into Wonderland, seeing as she and Mrs. Tiggy-Winkle are close to the same size when in her home. It’s not until after the two of them had delivered clean laundry to some of the characters from Potter’s other books (I’ll get to that in a minute) and had received a bundle containing her pinny and pocket handkins (Potter’s words for them), does she turn around to see Mrs. Tiggy-Winkle heading home and then notices that her cap and shawl and petticoat are gone and that she’d turned suddenly very small and brown and was in fact nothing but a hedgehog. The book ends with a note saying that people think Lucie fell asleep and dreamed all of it, but also notes that if she dreamed it she shouldn’t have come away from the dream with a bundle of clean laundry. Though Potter’s Tales aren’t actually fairy tales (despite what the header on this blog might say), she seems to have harnessed some of that famously dream-like fairy tale logic. Other things jump out to me about these books. Like, did you know Beatrix Potter probably wrote one of the earliest interconnected fantasy universes? A somewhat bucolic one, but one just the same. Now, Potter's books can technically be considered a series. They're marketed as the "Peter Rabbit series". Even so, only four of them focus on the same stable of characters: The Tale of Peter Rabbit, The Tale of Benjamin Bunny, The Tale of the Flopsy Bunnies and The Tale of Mr. Tod. Even then, you’ll notice the last one is more focused on the villain of the piece. But still, what Potter manages to do is have her stories connect by having the characters from one book appear as supporting characters in others. So, Jemima Puddleduck appears in The Tale of Tom Kitten, then Tom Kitten appears as the protagonist of The Tale of Samuel Whiskers and Tom’s sister Miss Moppet has her own book The Story of Miss Moppet. Also, while the Fox in The Tale of Jemima Puddleduck goes unnamed, he does look an awful lot like the fox who was the villain of the later book The Tale of Mr. Tod. Some characters are more isolated than others while some stories like The Tale of Ginger and Pickles seem to revel in all the cameos they can bring in. Sometimes, characters who don’t have their own book appear in multiple books themselves, like the chicken Sally Henny-Penny. Honestly, I get a kick out of this because I grew up with American superhero comics and later discovered the interconnected worlds of authors like L. Frank Baum and Edgar Rice Burroughs. But it’s an interesting thing when you look at the current pop culture landscape and some of the interest and push back from using interconnected universes in movies. Needless to say, creating them is an art and one that Potter managed just fine. She seems to have realized (even if subconsciously) what a lot of big Hollywood types have not: that the universe is the icing, not the cake. In other words, each of the stories can be read individually and doesn’t completely rely on knowing what happens in another story in order to work. It’s only when you pan out and realize that a number of the characters are essentially “neighbors” that it comes into effect. It’s that combination of simplicity and complexity that makes it work. There’s other stuff to talk about, like the variety within Potter’s work. She wrote some books for very small children like The Story of Miss Moppet and The Story of A Fierce Bad Rabbit, both of which were published in an unfolding “accordion” style book. She wrote two books of nursery rhymes: Appley Dapply’s Nursery Rhymes and Cecily Parsley’s Nursery Rhymes. She dipped her toe into adapting legends and Aesop’s fables with The Tailor of Gloucester and The Tale of Johnny Town-Mouse. She even wrote a chapter book of sorts in The Tale of Little Pig Robinson, which was itself inspired by the famous poem “The Owl and the Pussycat” by Edward Lear. There are also the media adaptations ranging from The World of Peter Rabbit and Friends (really quite good), the CBBC Peter Rabbit cartoon (not bad) and that recent Peter Rabbit movie starring James Corden (haven’t seen it, but heard it was awful). But I fear I may be going overlong. Overall though, I’m glad to have made this strange association with Beatrix Potter and Easter, even if it’s through a tangent that connects them both with rabbits. I might not have read them if not for that. If you’re so interested, I suggest giving them a read. Though, something to be aware of if you’re reading these to your children: in addition to the more fatalistic aspects there are also some outdated cultural bits there. For example, Benjamin Bunny settles down and has a family with his cousin Flopsy. While this is not uncommon with animals and wasn’t particularly uncommon with humans in the 19th century, it is a cultural taboo now. So, deal with that accordingly. Anyway, until next time and a Happy Easter to all who are celebrating it! 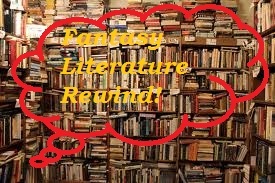 Fantasy Literature Rewind: The Water Babies.